The forthcoming gathering in Vienna will be the third since the March 2013 conference in Oslo convened by the Norwegian Foreign Minister Espen Barth Eide who said the Conference had “provided an arena for a fact-based discussion of the humanitarian and developmental consequences of a nuclear weapons detonation”. The second conference in Nayarit, Mexico, on February 13-14, 2014, discussed “global and long-term consequences of any nuclear detonation, accidental or deliberate, from the perspective and concerns of the 21st century society, including areas such as public health, humanitarian assistance, the economy, development and environmental issues, climate change, food security and risk management, amongst others”. Delegations representing 146 States, the United Nations, the International Committee of the Red Cross, the Red Cross and Red Crescent movement and civil society organizations, participated in the Nayarit international gathering. The chair added: “In doing so, we need to take into account that, in the past, weapons have been eliminated after they have been outlawed. We believe this is the path to achieve a world without nuclear weapons. In our view, this is consistent with our obligations under international law, including those derived from the NPT (Non-Proliferation Treaty) as well as from Common Article 1 to the Geneva Conventions. “The broad-based and comprehensive discussions on the humanitarian impact of nuclear weapons should lead to the commitment of States and civil society to reach new international standards and norms, through a legally binding instrument. “It is the view of the Chair that the Nayarit Conference has shown that time has come to initiate a diplomatic process conducive to this goal. Our belief is that this process should comprise a specific timeframe, the definition of the most appropriate fora, and a clear and substantive framework, making the humanitarian impact of nuclear weapons the essence of disarmament efforts. “It is time to take action. The 70th anniversary of the Hiroshima and Nagasaki attacks is the appropriate milestone to achieve our goal. Nayarit is a point of no return,” he said. 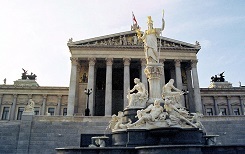 Against this backdrop, in a unanimous resolution, the Austrian Parliament has pledged its “full support” for the forthcoming conference in Vienna, which it expects to “give a new dynamic to the international disarmament discourse, through including the humanitarian impact to its scope and facilitating greater involvement of civil society organizations”. The motion was introduced by the members of parliament Mag. Christine Muttonen (SPÖ and Co-president of the network Parliamentarians for Non-proliferation and Disarmament PNND) and Dr. Reinhold Lopatka (Chairman of the ÖVP group in the Austrian Parliament) on April 30 in the foreign affairs committee. It urges the Federal Government “to continue its engagement on the international and European level for disarmament and for the complete prohibition of the development, sale, acquisition, proliferation and possession of nuclear weapons under international law”. - to advocate for a prohibition or at least for a stricter regulation of the export of nuclear technology in Europe. According to new research, even a limited regional nuclear conflict would cause devastating global consequences for health, food security, climate, economy and the social order much beyond the immediate humanitarian emergencies. “This danger is by no means abstract. It is a Sword of Damocles above our heads and should be at the center of international efforts. Moreover, the possibility of a nuclear explosion by accident, misjudgment or terrorism constitutes a considerable risk that we need to be aware of. Reliance on nuclear weapons is an outdated approach to security. A concept that is based on the total destruction of the planet should have no place in the 21st century”, underlined Kurz. “This discourse is especially necessary in Europe, where cold war thinking is still prevalent in security doctrines. 100 years ago, the era of weapons of mass destruction commenced with the devastating use of chemical weapons in World War I. In a today united Europe, we should use the commemoration to also make every effort to move beyond nuclear weapons, the most dangerous legacy of the 20th century”, urged Kurz. The importance of the forthcoming conference lies in the fact that Vienna is the seat of the only global organization dealing with nuclear issues: the International Atomic Energy Organization (IAEA). Together with the Comprehensive Nuclear-Test-Ban Treaty Organization (CTBTO), it plays a vital role in preventing the further proliferation of nuclear weapons. Despite reductions in the numbers of nuclear weapons since the end of the cold War, however, the number of nuclear weapons is still sufficient to extinguish human civilization. At the same time, the number of nuclear armed states has risen and the technological hurdle to build these weapons is getting lower. Austria therefore holds the position that the prevention of nuclear weapons can only be achieved in conjunction with credible and irreversible nuclear disarmament and the international stigmatization of nuclear weapons. As was stressed in Oslo and Nayarit, in the event of a nuclear explosion, governments and relief organizations would not be in a position to provide humanitarian assistance adequate to the scale of the emergency. For this reason, Austria considers the close cooperation with these organizations and civil society at large an essential element to build the broad international support that is necessary for the elimination of nuclear weapons, according to a note posted on the Austrian Foreign Ministry’s website. Though a world without nuclear weapons is a goal shared by all humanity, it has remained elusive so far. An estimated 16.300 nuclear weapons still exist nearly 25 years after the end of the cold war. Nine states are believed to possess nuclear weapons, but as nuclear technology is becoming more available, more states, and even non-state actors, may strive to develop nuclear weapons in the future. The Austrian Foreign Ministry argues: As long as nuclear weapons exist, the risk of their use by design, miscalculation or madness, technical or human error, remains real. Nuclear weapons, therefore, continue to bear an unacceptable risk to humanity and to all life on earth. Any use of nuclear weapons could cause gravest humanitarian emergencies and have catastrophic global consequences on the environment, climate, health, social order, human development and the economy. A single detonation of a modern nuclear weapon would cause destruction and human suffering on a scale far exceeding the devastation seen in Hiroshima and Nagasaki. No State or international body would be able to provide adequate assistance. Nuclear weapons continue to pose an existential threat to all humankind. These risks are not abstract. They are real, more serious than previously known and can never be eliminated completely. Increased focus on the humanitarian consequences of nuclear weapons is, therefore, an important development and has a positive and uniting effect on international discussions about nuclear weapons. The more the international community discusses and understands the scale of these consequences and of the risks involved, the clearer the case and the stronger the sense of urgency become for the elimination of nuclear weapons. With the forthcoming conference, Austria wishes to strengthen the global nuclear disarmament and non-proliferation regime and to contribute to the growing momentum to firmly anchor the humanitarian imperative in all global efforts dealing with nuclear weapons and nuclear disarmament. According to the Austrian Foreign Ministry, the Vienna Conference will be open to all interested parties. All states will receive official invitations and will be invited to nominate experts and/or senior officials. International organizations and civil society representatives with relevant expertise will also be welcome.